The election was held on 5 September, 1914. This was the first election resulting from a double dissolution of Parliament. The election was overshadowed by the outbreak of the First World War. 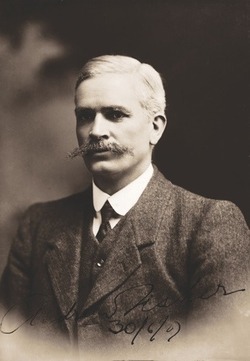 Prime Minister Joseph Cook proposed bringing in a new voting system of preferential voting for the House of Representatives and proportional representation in the Senate. During the election campaign Fisher uttered his famous line supporting the British war effort ‘… to the last man and last shilling.’ Fisher won the election comfortably, with Labor winning 42 seats and the Liberal Party 32 seats in the House of Representatives. The conduct of the war now became the primary focus for the Fisher government. Andrew Fisher was born 29 August 1862 and died 22 October, 1928. Fisher was the Prime Minister of Australia on three separate occasions: 13 November, 1908 to 2 June, 1909; 29 April, 1910 to 24 June, 1913; and 17 September, 1914 to 27 October, 1915. He was the Leader of the Australian Labor Party. Fisher represented the electorate of Wide Bay, Queensland 1901 to 1915. Open discussion in Parliament has revealed to the public the shameless character of the Government in financial matters. When the Treasurer made a financial statement on June 11 he stated that he estimated to close the financial year 19 days later with a surplus of £824,305. When he made that statement he knew that he had spent £1,819,000 more than the revenue he received. In the discussion that followed the naked truth was revealed that he had no surplus; but that did not deter the Prime Minister from going to Tamworth afterwards and stating that his Government would finish the financial year with a million surplus. The demand for a frank statement of the financial position joined in by a portion of the press became so persistent that the facts could not longer be safely withheld. In a statement made a fortnight later, Sir John Forrest made a clean breast of it, and admitted he had not only spent all his income for the year, but had also spent in addition £1,819,000 of the 2,643,205 surplus (audited) left by the Fisher Government. Since then the Treasurer has issued a final statement in which he shows that his expenditure exceeds his revenue for the year by £1,534,977, instead of his estimate of £1,819,000. These facts show that the Fisher Government during their three years in office spent £100,000 per month less than their income, while the Cook Government is spending nearly £130,000 a month more than their revenue. These figures reveal the fact that the Commonwealth has been £280,000 a month worse off since the Cook Government has been in office. When the Government could no longer hide their financial nakedness behind bluff and shuffling assertions, the Treasurer admitted his financial difficulties for the future, and cheerfully met them with the bold declaration, “the coast is clear for borrowing, and we can afford to pay the interest.” In the words of a young and indiscreet supporter, this is the keynote of the Cook Government’s future financial policy – ‘the coast is now clear for borrowing.’ Now the surplus is out of the way, all is plain sailing for piling up a national debt. The Fisher Government left millions of trust fund money available for loan expenditure without any necessity for the Cook Government to appeal to the cold world outside. The announcement by the Treasurer shortly before the Parliament closed that it was the intention of the Cook Government to borrow money to pay for the defence of Australia demands the attention of all patriotic citizens. It is a policy which leads to disaster and ruin. It offends against the sound principle that in peaceful times the cost of defending a country shall be provided out of that country’s revenue. For, if our credit is pledged in time of peace and prosperity, we shall have no reserve nor resources in time of danger and attack. The Labour policy as regards defence finance, is that all expenditure in time of peace shall be provided out of revenue, leaving in reserve all other resources to be drawn upon to ward off attacks from enemies. The great vital problems that confront us in Australia today are principally these:- industrial unrest; increase cost of living; operations of trusts and combines. They are interactionary both in their relationship and their effect. They are not peculiar to Australia. Their effect is felt around all civilized nations. They cannot be ignored. They must be faced, and dealt with. The Labour party is anxious to deal with them. I believe it is the only political party that can deal with them. To that end we have repeatedly advised the people of Australia in their own interests and for their own protection to give to the Federal Parliament the increased powers mentioned in the Referendum Bills. It may not have been a popular action, considered from the party standpoint. We recognize it as a national matter distinct from party. You know that in 1911 the Referendum Bills were submitted to the people, but the majority of the electors voting did not approve of them. In 1913 they were again submitted to you, and while they again failed to secure the necessary majorities, the margin against them was very small. In 1911 the greatest majority against them was 259,248, or 21.15 per cent of the aggregate vote recorded. In 1913 the greatest majority was only 33,688 or 1.7 per cent of the aggregate vote recorded. The majority against the trusts amendment was only 8612 or less than 1 per cent. These facts show that the necessity for amendment is widely recognised by the electors; that a great number strongly desire it; and that, if given another opportunity, the Referendum Bills will probably be carried. The Fusion Government does not believe in dealing with these great questions. They will not submit proposals to the people for the necessary amendments in the Constitution. Mr. Good said in Parliament that he did not believe in such amendments. He has refused to permit the Governor General to exercise the power vested in him by section 128 of the Constitution, and grant the request of the Senate that the six Referendum Bills be again submitted for your decision. Mr. Cook said on July 17 that infinite injury would be done to the country if the electors were even permitted to again give a decision thereon. He said in a speech at Tamworth on June 22 that these proposals would strangle the Constitution, and that we who advocated them were ‘political assassins.’ We have never held that the Constitution is sacred. We hold rather that what is sacred is the welfare of the people of this country. The real assassins are Mr. Cook and his Fusion following. It is they who are permitting trusts, combines, and monopolies to run a noose round the necks of the Australian people. They will permit, aye, encourage, industrial unrest. They will aid and abet by their inaction the strangling operations of trusts, combines and monopolies. They are strangling the industrious workers of this community by permitting the unprecedented increase in the cost of living. They are the real assassins of the public good in this Commonwealth. Industrial unrest is worldwide. It is dominated by high prices and low wages. What we desire is industrial peace – the removal of the causes of unrest and the provision of the means for the settlement of disputes when they arise. It is a tribute to the working man of Australia that since the establishment of the Arbitration Court there is no record of a case in which its award has been disobeyed by them. wages boards and Arbitration Courts have done very little to raise wages. They merely act (he says) to register the gradual improvement that arises from other conditions. Although the cost of living has not risen here as it has done in certain other parts of the world, everyone knows that in the past few years, it has exhibited a decided upward tendency, which has affected the pockets of most of the electors. The latest bulletin issued by the Commonwealth Statistician, in June of this year, shows that in the proceeding quarter the cost of living (groceries, food and rent) had appreciably increased in all States but Western Australia. In that State strenuous efforts are being made by the Labour Government to cope with the difficulty, and the steady decrease in the figures during last year and this year bear witness to the success of their efforts. In all other States the monotonous increase has been maintained. This increase has not arisen from the operations of wages boards and Arbitration Courts. It has not arisen from a shortage of production, for we have never been blessed with more prosperity in this country than during the past five years. It can only have arisen from an interference with the supply, both at its source ad during its passage to the consumer. Trusts, combines, and monopolies are the objects at which you must direct your efforts to bring down the increasing burden. The Labour party will aid you. It asks for your support for that purpose. greater than the Government; greater than courts or judges; greater than legislatures; superior to and independent of all authority of State or nation. In a country of law they exist, and proceed in defiance of law. Its operations have impoverished or ruined farmers and stockmen, destroyed millions of investments, precipitated strikes, and annihilated industries. Such is the Beef Trust of America which in five years doubled the price of meat to the consumer, and in the same period reduced the price of cattle to the producer by 18 per cent. This trust consists or did recently – of Swift, Morris, Armour, and the National Packing Company. Day after day these four firms fixed the price at which cattle should be purchased from the farmer. There was but one market, and but one bidder. They fixed the price at which the dressed beef should be sold to the consumer, and there was but one seller. That trust is now here. Mr. Cook admits it is here. You have felt the result already. We want to deal with that and all other combinations acting, or likely to act, detrimentally to the people’s interests. Your State Parliament cannot do anything effective. Yet the Commonwealth Parliament is so shackled by the Constitution that any action must prove abortive. It must have occurred to the primary producers that something is wrong with the commercial condition of this country, when, amidst the accumulation of great wealth, their share is at least not increasing, while their struggle for subsistence is becoming keener. Statisticians try to show us what a progressive people we are, and how we accumulate wealth. But the question most often discussed in the homes is one of a different kind. It is not how much we can put aside for sickness and old age; it is relatively how people are going to make both ends meet from week to week. As regards the producers, we believe that relief can be given, and probably a remedy found, for many of their difficulties by the State bringing into existence agencies which will carry the product of farm, of stations, of the mine, and of the orchard, to the markets of the Commonwealth and to the markets of the world, with the least possible delay and expense, and with absolute security of full reward to the producers for their products. Concurrently, with that must go the establishment of agencies in the markets of the world, and employment of the State credit to advance to the producers a substantial percentage of the value of the products at the lowest rate of interest; and full settlement with them of the prices realised immediately after the sale. We propose to establish a line of steamers between the mainland and Tasmania and also overseas. The latter should be of increased speed, with resultant advantage to the passengers, shippers, and the general public alike. Fierce and unfair criticisms of State enterprises has too long deferred a progressive people from taking steps to protect their own interests against overcharges and monopolistic influences. There is abundant evidence of the value of State enterprises, especially in the direction of production of agricultural implements in Western Australia, and the more considerate treatment accorded to the producers. The policy of the Labour party has been and is along the lines of the new protection. Since our appeals to the electors for power to give effect to that policy have been twice refused, and recognising that many industries cannot exist, much less prosper, without effective protection, we pledge ourselves, if returned to power, to amend the tariff during the first session of the new Parliament to give effective protection to Australian industries. It is rather an interesting fact that in my first Federal electoral address in 1901 I advocated an amendment of the Constitution providing for – (a) the initiative; and (b) substitution of a national referendum for the double dissolution and settlement of deadlocks between the two Houses in relation to matters affecting the Constitution. In my policy speech at Maryborough last year I indicated the proposals of the Labour party with regard to the initiative and referendum. We still stand by that policy. We propose, if returned to power, to introduce without delay a measure to provide the machinery whereby a prescribed number of electors may request the Parliament to legislate in a certain direction. Such proposed law, or others originating in the usual way in the Parliament, shall, upon the number of electors so requesting in the prescribed way, be submitted to the people of the Commonwealth by way of referendum. These great instruments of democratic Government will bring the Parliament, we hope, into more sympathetic and effective touch with the people, and will give the latter complete control. They will enable beneficial legislation to be submitted for approval or otherwise without the disturbing factor of party enmity. People’s ideas of what the Constitution meant, and what the Government declared and said have been diametrically opposite; and now on top of it all we have a strained and strange interpretation, which results in the demand that power be given to the people directly to so adjust the Constitution as to make it accord with their views as to what it should be. Notwithstanding its drawbacks, we look upon arbitration as a civilised system of obtaining justice between all citizens with the minimum disturbance of industrial relationship and the minimum of distress. The present position is intolerable, approaching robbery of hardly-earned money. Our aim is industrial peace. But to delay justice is to deny it. Uncertain law is no law. The present “Serbonian bog of legal technicalities” ruins the unions and is a mockery of justice. To rob the workers of their strenuous earnings in order that they may win through the artificial technicalities of the Courts defeats the very purpose and object of the law. If parties to a dispute cannot get grievances redressed by the Court, they will readily resort to the only courses open to them – strikes and lockouts. We desire, therefore the widest possible opportunity to be afforded all workers and employers to approach the Arbitration Court, and this policy we shall give effect to if returned. The High Court has recently decided that part of the Arbitration Act providing for industrial agreements and their enforcement does not cover agreements between employers and employed, fixing wages, hours, and conditions of work. Amendments must be made to provide for such agreements which make for industrial peace. Referring to the sugar industry, Mr. Fisher said he had no reason to depart from his views expressed at Bundaberg five years ago, which he stated were on the lines that justice could not be done to any or all of the parties unless the Commonwealth Parliament had powers sufficient to enable it to appoint a tribunal competent to say what was the value of the labour put into the sugar product before it reached the consumer – of the worker, of the grower, the raw miller, the refiner; and the intermediates who handled it. He only regretted that the referendum had not been carried at the last elections, as he believed such a result would have solved the problem. Launched amidst the croakings of financial pessimists, the Commonwealth Bank has amply justified its existence. Against its first half-year’s operations were debited the whole expenses of commencing business. The governor did not attempt to outbid the other financial institutions in order to attract business. In my opinion, he acted with discretion in seeking to build up a National bank that ultimately should be the bank of banks within the Commonwealth. It has never been a subject of pleasant consideration for the Fusion party. They opposed its creation. They predicted failure. When in office, acting as the people’s trustees of the bank, they did not scruple to misrepresent it on the public platform. Yet these circumstances notwithstanding, the bank is rising triumphant over drawbacks, and already is in a splendid financial position. It has therefore shown that it has gained the confidence of its shareholders – the people of Australia. on terms which would be beneficial to all three and to the people alike. He held that the more facilities there were offered the people to save money the better for the community generally. He further made the States an offer for the amalgamation of the Commonwealth and State Savings Banks on practically the same terms as those which I offered in 1912. If we are to believe the statements made by the Premiers of New South Wales and Victoria, the competition of the Commonwealth Bank enterprise in the Savings Bank Department has been beneficial to them rather than the reverse. I am totally opposed to the Government’s proposal to do away with the Commonwealth Savings Bank. I submit that the proposal I made to the Premiers in 1912 is equitable as between the Commonwealth and the States representing the same people via an amalgamation of the Commonwealth and State Savings Banks on equal terms of participation in capital and profit; each State to retain all its current investments, and also to have first call on three-fourths of any further deposits in that State available for investments, as regards the remaining one-fourth, all parties to share equally in opportunity for its investment. We have always been in favour of an Advisory Board, consisting of representatives from each State and one from the Commonwealth to sit from time to time, and advise the governor of the Bank on financial matters of the Commonwealth and the States, conditional upon the Governor having a casting vote. I placed this before the Premiers at the 1912 conference, and repeated it again and again in Parliament. The principle of the amalgamation would not in any way interfere with the present arrangements of Credit Fenciers, Agricultural Banks, or agencies for advancing money to settlers. The governor of the bank definitely states he has no wish to enter into that line of business. Under the amalgamation, indeed, the possibilities of such Credit Fonciers, etc., will be extended instead of lessened. They will be able to utilise for the purpose all the money coming to their share, without any deduction, as at present, for the purpose of carrying on the Savings Bank business. I have no doubt that at an early date a credit system that will greatly benefit primary producers will be a feature of the Commonwealth Bank. The policy of an Australian-owned, manned and controlled Navy, initiated by the Labour party, will be developed along the lines laid down should we be returned to power. Our party has also initiated the policy of local construction, and will continue to extend that policy. Action will be taken to overcome the results of the policy of procrastination and delay in these matters that has so characterised the administration of our opponents. In 1910 we repealed the Naval Loan Act passed by the Fusion Government, and met all obligations for naval expenditure out of revenue. We are still relentlessly opposed to borrowing for defence. We believe that a sea defence is an essential part of the defence force; and that whatever the size of the navy, it must be efficient, i.e., the best of its kind. But it must be limited in time of peace by the amount of money available for the purpose out of our annual revenue. He charged the Liberal Administration with creating trouble in the Navy. He was not quite sure, he said, whether it was not attempting to undermine the principle of an Australian owned and manned Navy. The universal military training scheme set going during our administration is giving good results to the nation. A careful watch will have to be set on expenditure under this head, and every endeavour made to see that money is not frittered away on things that are not essential. In regard to the cadet training between the ages of 14 and 18 years some alteration is necessary. It must be emphatically laid down that harsh treatment is to be avoided, and the greatest consideration given to youths as regards loss of work time, and the carrying out of training on special days when other people are holidaying. It will also be necessary to provide that when trainees are giving their time for preparing themselves for the defence of their country they shall not suffer monetary losses. In connection with punishment for breach of the Act, we favour all prosecutions of cadets being entirely dissociated from criminal courts, and, if necessary, that special magistrates should be appointed to hear such cases. A good deal has been heard recently about the solitary confinement of cadets for breaches of the law. The facts are that the Fusion Government of 1909 provided that cadets should go to gaol. The Fisher Government altered the law to provide that instead of gaol places of military detention should be substituted. The only places available were the barracks in the capital cities and the quarters at fortresses. Let me say that no case of solitary confinement ever came under the notice of Senator Pearce when in office, and there were no regulations to provide for that punishment. We shall endeavour to see that no variation of the sentence imposed by the civil courts is made by the military authorities. He would regard it as a national calamity if the principle of providing for the aged destitute by gratuitous doles from the public Treasury of Australia were to be made a permanent part of our policy. And the statement was received with approving applause by several hundred ladies and the few gentlemen who were reported to have been present at St. Kilda to support the Conservative idol. The Labour party, which has extended powerful support at all times to this measure, will maintain it intact. But there is another aspect which appeals to us. During recent years invalid and old-age pensioners have suffered, with other citizens, from the increased cost of living. Their appeal from relief and assistance can be made only to Parliament. I freely admit their claims are reasonable and should we have the responsibility of directing the affairs of the Commonwealth in the next Parliament they will receive the most favorable consideration that our financial position will permit. Among the large number of Acts passed by the Fisher Government was one which made provision for payment of a maternity allowance of £5 to any mother who applied for it. Its object is to protect mothers from the fear of misery and want at that period of their lives. The Fusion party are opposed to the maternity allowance. One section led by Sir William Irvine, says that it “saps the moral fibre of the nation,” and in keeping with such views, sneer at it as a ‘baby bonus’. The other section less bold, prefers to be against its principles of payment without a declaration of financial necessity. We are responsible for the policy, and will maintain it as a just, humane and beneficial piece of legislation for the welfare of the nation. The saddest things in human life are orphan children. Their fateful misfortunes have in all ages enlisted the sympathy of the benevolent and charitable. They are innocent of their condition. They will always be with us. Yet provision for their care and welfare remains today an unsolved problem. While fully appreciating all the steps that have been taken by State and private benevolence, the question demands permanent and satisfactory solution in a young country like Australia. It is a national undertaking, and provision should be made for it by the Commonwealth. As far as that is practicable and possible under our constitutional powers, the Labour party will give effect to it. We believe that the question of the adoption of a uniform railway gauge for Australia is an urgent one. A uniform gauge would effect economy in rolling stock, and in expense necessitated at every break. It would tend to the comfort and convenience of passengers. It would encourage traffic through improved facilities being offered. Above all, it is of paramount necessity for the expeditious transport of our military forces in time of war or emergency. A conference of railway engineers of all States except Tasmania in 1912 emphasised the fact that the longer this unification is postponed the more serious will the cost become. They advocated its adoption, and decided that the future standard should be not less than 4ft 8 ½ in. Since I last spoke on this question, however, Mr Cook has been to a conference with the Premiers. As a result we are no further forward. The Cook Government has turned its back on this great national work. It accepted a resolution of the conference that the question be referred to the Interstate Commission for report whether it is desirable to adopt a uniform gauge; if so, when and what gauge should be adopted? Also how, the cost is to be apportioned. Mr Cook, speaking of this decision said: “I feel something has been gained.” Distinguished as are the members of the Interstate Commission, they can add but little to the views of the distinguished and experienced gentlemen who so carefully considered the matter in 1912. The thing has been effectively pigeon-holed, yet Mr. Cook ‘feels that something has been gained’. We are in favour of a uniform gauge from Fremantle to Townsville. It is an urgent necessity for reasons of economy, transport and effective defence. During our term of office we gave careful consideration to the question of reciprocal trade relations with New Zealand, Canada and other Dominions. We are fully in favour of such a course, and of every means being established which will draw closer together – both socially and commercially – the great self-government Dominions within the Empire. The matter was advanced by us with Ministers from New Zealand and Canada. The Cook Government apparently has done nothing in that direction, however, if the Labour party be returned to power, we shall enter into negotiations with a view to bringing the proposals to fruition. The Labour party regards the health of the people as of paramount importance. It announced prior to the 1913 elections that it would set aside a considerable sum for the purpose. The Cook Government has done nothing in this direction, but we shall, if returned to power, provide funds for the prevention and cure of cancer, consumption and the red plague. The State-owned Pacific cable is dependent upon private lines across the Atlantic. These effectually prevent any adequate cheapening of the cost of cable communication with Europe. We are in favour of a State-owned Atlantic line being laid down, and shall vigorously pursue that policy. A general insurance law has been long needed. The Labour party in the Senate this session introduced as a private measure a measure of this character to ensure uniform protection of funds, and prevent abuses. It is an important matter, and will have the close attention of the Labour party. We aim also at establishing a Commonwealth Government Insurance Department. This is a somewhat new departure in Australia, but has rendered good public service in other parts of the world, and will probably benefit the people of Australia. A Bankruptcy Bill providing for uniform law and administration through Australia formed part of our policy at last election. Such a bill has been introduced in the Senate as a private measure by a member of the Labour party this session. If we are returned to power, this matter will be earnestly supported by our party. The establishment of a Commonwealth Public Service superannuation scheme on a sound financial basis is desirable at an early date in the interests of those immediately concerned. In my opinion the management of it should be undertaken by the government which should guarantee its permanence and stability. Any legislation necessary for that purpose will have my support.